The United States Department of Agriculture’s Food Safety and Inspection Service (FSIS) has released a new video today to demonstrate safe food handling for spring celebrations. The three problematic foods for Easter and Passover are eggs, brisket, and ham. Eggs are central to Easter celebrations, but they are a common source of foodborne illness. Make sure you cook eggs thoroughly, with firm yolks and whites, and always keep them refrigerated. If you plan to dye eggs and hide them for an Easter egg hunt, don’t leave them out of refrigeration for more than two hours; one hour if the ambient air temperature is above 90 degrees F.
Hide eggs in safe places for the hunt. Don’t place them directly on dirt, or in areas where pets go to the bathroom. And if you want to eat the eggs hidden for a hunt, wash them after they are found and refrigerate them promptly. Eat them within seven days of cooking. Brisket isn’t difficult to cook, but thawing it if it’s frozen, cooking it properly, and reheating it can be tricky. Never thaw meats on the counter; thaw them in the refrigerator. For large cuts of meat, this can take time; a brisket can take several days to thaw in the fridge. Brisket is usually cooked to 185 degrees F. This is a higher temperature than other meats because the fat and connective tissue won’t melt until the meat reaches that temperature. When reheating brisket, heat it to 165 degrees F and use a food thermometer. Keep it above 140 degrees F when you hold it on a warming tray or in a chafing dish. If you want to serve meat cold, it must stay below 40 degrees F. And don’t leave it out longer than two hours. There are four main types of ham available in the market. ham is a leg of pork. When it’s cured, it’s called a ham. Fresh hams are not actually hams; they are cut from the leg, just as a ham is, but they are not cured. Fresh ham and cook-before-eating ham. These hams must be cooked to 145 degrees F. Note this lower temperature; last year the USDA lowered the safe final temperature of pork to 145 instead of the previously recommended 160 degrees F. Don’t cook hams or any meat in an oven set lower than 325 degrees F. And when you’re checking the temperature, make sure the thermometer probe doesn’t touch bone or fat. These hams include bone-in hams, dried hams such as prosciutto, and boneless hams. You can eat these cold right out of the package, or reheat them to 140 degrees F, again in an oven set no lower than 325 degrees F. The slow cooker is a great way to heat these hams because the moist environment helps prevent drying. Place the ham in a slow cooker large enough to hold it easily. Add a cup of liquid, cover the appliance, and cook on low for 6 to 8 hours. These fully cooked hams are precut and already glazed. They’re a great choice for buffets because they can be eaten cold. If you want to heat them, heat in a 325 degrees F oven for 10 minutes per pound until the internal temperature reaches 140 degrees F. Heat leftovers to 165 degrees F. To reheat, place cut side down on foil and wrap well. You can add any extra glaze that came with the ham after it’s reached 140 degrees F, or add your own. These hams are dried and have a wonderfully intense flavor. They are soaked before eating to reduce salt content. Make sure you keep the ham in its soaking liquid in the refrigerator. 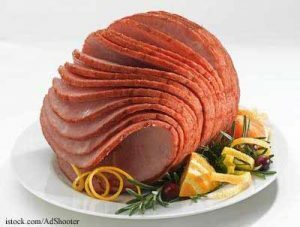 The hams are then boiled or baked; follow the manufacturer’s cooking instructions. Leftover cooked ham must be refrigerated and eaten after five days. It can then be frozen, up to three months, if properly wrapped in freezer material and kept in a freezer set below 0 degrees F.